Procurement, as defined by the Government of India’s General Financial Rules (GFR) 2017 means "acquisition by way of purchase, lease, license or otherwise, either using public funds or any other source of funds (e.g. grant, loans, gifts, private investment etc.) of goods, works or services or any combination thereof, including award of Public Private Partnership projects, by a Procuring Entity, whether directly or through an agency with which a contract for procurement services is entered into, but does not include any acquisition of goods, works or services without consideration”. With an annual procurement value over INR 200,000 crores and volume of more than 100,000 tenders, Indian procurement is one of the largest in the World. Conducted and delivered in very wide and disaggregated levels, Indian Public Procurement also present a variety of needs and challenges with its federal structure, decentralized nature and the plethora of policies, procedures, methods, bidding documents, etc. Public Procurement is leading to unprecedented changes in the fast pacing digital transformation of governance in India. Almost all states have introduced electronic procurement and out of these 27 states and more than 350 entities now use the Government e-Procurement portal developed by National Informatics Centre. Recently launched Government e-Marketplace is also being extensively used for procurement of common use items by all Central Government entities and many states. Modernization of policies, procedures are happening across the board to conform to the best practices in the sector. All these developments are creating a huge demand for an aggregator function of information, guidance notes, good practices, learning programs and above all an interface where procurement professionals can interact and exchange on a variety of issues. 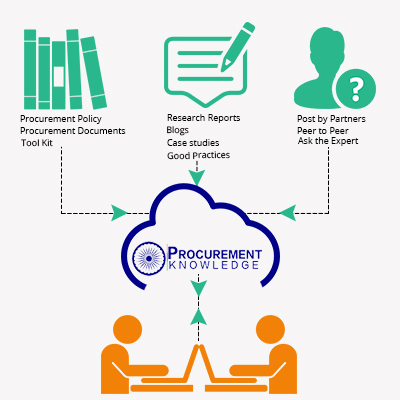 India Procurement Knowledge portal is conceptualized and brought to you as one of the efforts for filling the above gap. Portal endeavors to be a single window repository on regulatory framework of procurement at central and state levels, operational data and analytics on procurement in India, a resource center for practitioners, professionals, academicians and researchers, stakeholders; and a knowledge exchange platform among professionals. The portal is developed and hosted by All India Management Association (AIMA) with support of the World Bank Group.